In order to safeguard the interests of the citizens of the State, the government’s every recruitment authority’s main objective is to adopt transparency for each and every process at each level. The Rajasthan Public Service Commission took e-initiatives since 2011 and regularly upgrading themselves with latest technology and innovations so that the demands for the services and solutions can be made available to the all with transparency. Unlike in online exams, candidate of offline exams have the advantage to take home the question paper and carbon copy of OMR sheet. In online exams, candidate feels lack of transparency as neither the question paper nor OMR copy is in their hands, leaving them with lot of uncertainty. For example candidates could have doubts, like why negative marking was done when they didn’t even attempt those specific questions, or some questions were out of syllabus among others. For last few years, RPSC had been trying to find some innovative solutions for such issues in online examination where the candidates can see the answers they give. Finally the commission has come up with a system, developed by an Associate Online Examination Consultant that takes care of the candidates’ concerns. MEMORY – My Exam My Online Review- software has been designed and developed in such a manner that after completion of online examinations, the candidates can view start-to-end automatic action replay of their examination on the RPSC website. The Public recruitments are quite a critical and sensitive task and the MEMORY software increases chances of transparency in an unique and innovative way. The RPSC launched the software from School Lecturer (COACH) exam, which was held on April 11, 2015 and garnered good response from the candidates. The software runs on windows platforms and the size of software is known to be less than 150kb, only in unzipped form. In addition to that, this software has ensured highest security and 24x7availability across geographies. The commission has kept simultaneous log in limits for three candidates. They can log in with the allotted roll numbers and the one time passwords that would be received on the candidate’s registered mobile number. The MEMORY will take candidates through all action and activities executed across by them during examination period and time spent time on the examination screen. 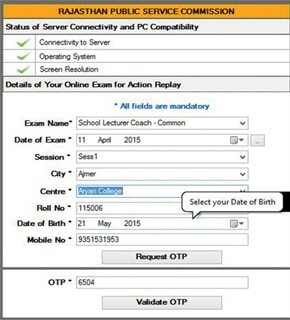 With this innovative move, RPSC has taken online examinations to next level of digititsation.